ST. GEORGE — Local fire officials over the past couple of days have talked with St. George News about how the fire at the St. George LDS East Stake Center was a “perfect storm” of vulnerability for a building under construction. Others have remained generally tight-lipped about the fire, which is being investigated as a possible arson. However, the Bureau of Alcohol, Tobacco, Firearms and Explosives on Wednesday offered a reward for information leading to the arrest of individuals who may have started the Jan. 26 fire. The St. George Police Department, Utah Fire Marshal’s Office and ATF launched an investigation into the fire in order to cover every possible angle, St. George Police officer Tiffany Aktin told media in the aftermath of the fire. During a press conference held at the church site it was reported that signs of possible accelerants were found at the scene and that the ATF had collected evidence for review. The results of that review have yet to be disclosed, but by offering the reward, the agency may have signaled which way the evidence is pointing. 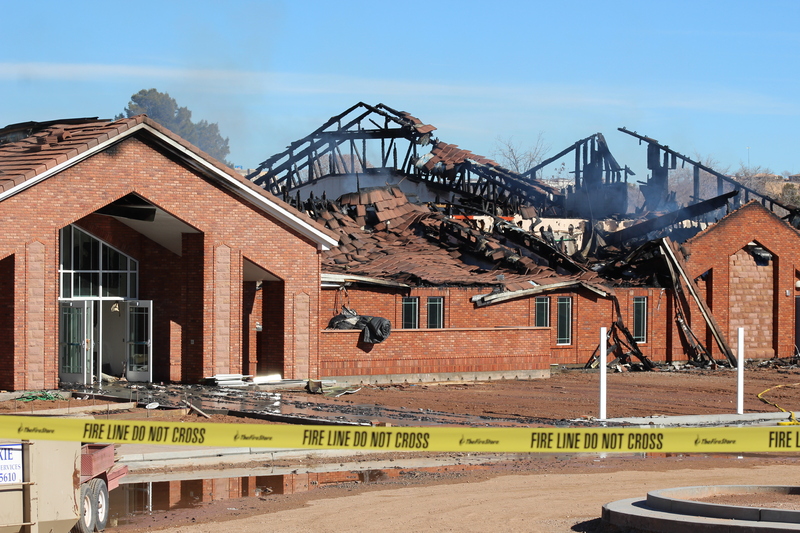 The fire that destroyed The Church of Jesus Christ of Latter-day Saints stake center at 449 S. 300 East torched a building that was nearly completed. The new stake center was meant to act as the new primary chapel of the LDS St. George East Stake. While following up on issues related to the fire, St. George News contacted the St. George Fire Department. While they were unable to comment on the investigation, Fire Chief Robert Stoker and city Fire Marshal Kevin Taylor talked about why the fire spread the way it did once it started. A building is most at risk for fires and other hazards when its under construction, Taylor said. 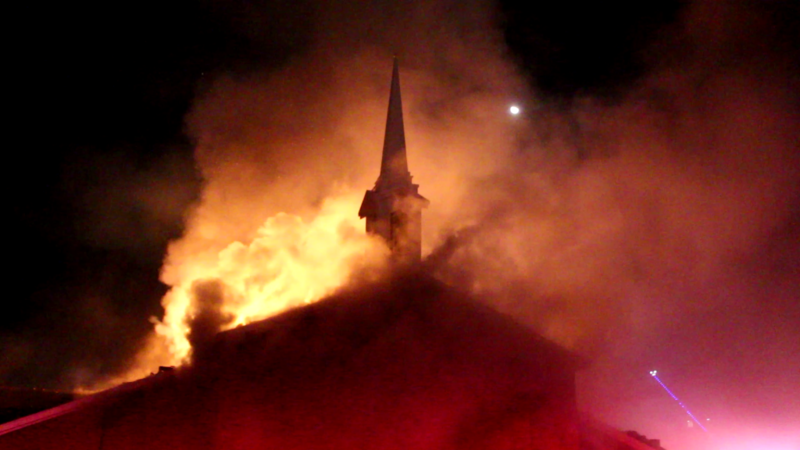 The fire started on the southeast side of the church on the outside. Once it ignited, it went up the side of the building and under the building’s eaves. From there, it traveled into the attic. While the exterior walls of the church were covered in bricks, the inside was framed using wood. The trusses creating the roof were also composed of wood. Taylor said the trusses, while structurally sound and economic for builders to use, don’t stand much of a chance against a fire. The trusses aren’t that dense, both Taylor and Stoker said, and can begin to show signs of buckling within four to five minutes during a fire. When that happens, the metal cleats that hold the trusses together begin to pop out, and the overall structure fails, causing a collapse. “That’s a lot of the reason why we don’t go onto the roofs of smaller homes,” Stoker said. The roof and ceiling of the church began to collapse soon after firefighters arrived on the scene and entered the church. The result was they had combat the fire on the outside while it tore through the building. 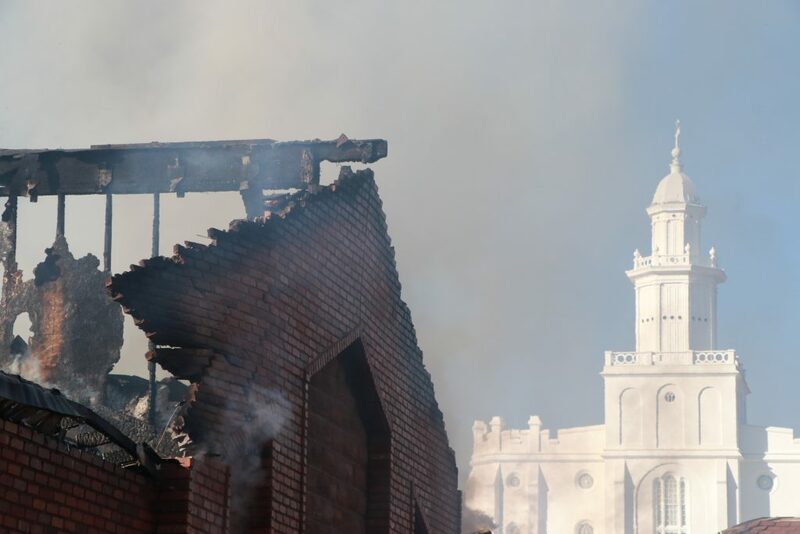 So the questions arise as to just what caused the fire to spread from one end of the church to the other the way it did, and whether it could have been avoided. Under construction code set by the National Fire Protection Association, when building the roof, structures called “draft breaks,” which act as physical barriers, are to be placed at various intervals. They create “concealed space” where a fire can be contained for a time before spreading to the rest of the structure. However, the code exempts the installation of the draft breaks if a sprinkler system is installed inside the roof, Taylor said. That was the situation involving the LDS stake center. Since it had a fire suppression system installed inside the attic, draft breaks weren’t required. Unfortunately, the absence of the draft breaks also turned the attic of the church “into a horizontal chimney,” Taylor said. Once the fire was sucked into the attic, pressure inside moved it westward with nothing in its path to stop it, Stoker said. Many fires have been extinguished by just one or two sprinkler heads on a fire suppression system, he added. However, the suppression systems, while installed at the church, were not active. Such systems generally aren’t in use during construction. “You don’t have to have the system charged until you go for your occupancy permit,” Belliston said. At that point, when the contractor believes everything is complete and ready to go, the fire marshal inspects the building and signs off on whether it is fit to let the public inside. “There are a lot of variables to sign off before you can bring people inside,” Belliston said. From there on out, the fire suppression system is active and ready for use. Overall, it was a “perfect storm” of vulnerability, Taylor said. 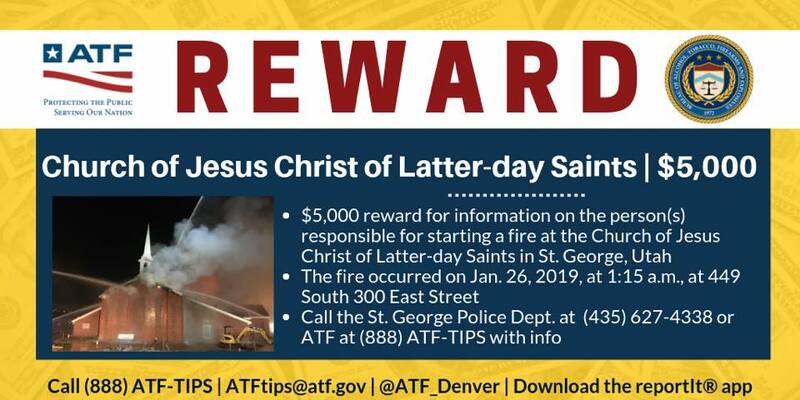 The St. George Police Department posted the $5,000 reward notice from the ATF’s Denver Field Division asking that people to either contact the department at 435-674-4338 or the ATF at 888-ATF-TIPS. Information can also be sent to the ATF at ATFTips@aft.gov or through the ATF’s website. Tips can also be submitted anonymously using the Reportit app that can be downloaded on a smart phone via the Apple App story or Google Play.